In our multicultural word, we often find ourselves within Microsoft Office applications, the necessity to work in other languages rather than our native language. We can even set both the Display Language and the Editing Language to be the same, or we can make them to be in different languages if we want. We can have multiple languages installed, and switch between them quickly and easily. Below, I will describe and show how to make Microsoft Office applications to work in another language. Display Language: Also known as User Interface or “UI”, which is all the buttons, menus and commands in Office. Editing Language: Is the Language, where we type and edit our content. Proofing Tools: So we can do the Spelling and Grammar check. We must select the Review tab and locate the area of the ribbon named Language as shown below. Set Proofing Language: We can choose the language of the selected text. Language Preferences: We can set the editing, display, Help and ScreenTip Languages. Whichever of the two above commands we select, the Word Options dialog box will appear as shown below, with the Language Category selected from the left. We Can Add Additional Languages To Edit Your Documents. The Editing Languages Set Language Specific Features, Including Dictionaries, Grammar Checking And Sorting. In the image below, we can see the Editing Languages that are installed, where for the example below we have the Greek and the English Language installed. We also notice, that the Keyboard Layout is Enabled, and Proofing (Spelling, Grammar, etc.) are installed. In order to add a Dictionary in Microsoft Word, you can check out the post that I have described at https://officesmart.wordpress.com/2014/03/05/add-a-dictionary-in-word-13/. In this area, we can set the Language priority order for the buttons, tabs and Help. By changing the Display Language and the Help Language, all the commands (menus, commands, areas, etc.) will match the Display Language that we have selected. The same stands for the Help Language also. In my example, I have the English and Greek language installed for the purpose of my posts. If we change the Display Language, we will be notified to restart the application for the changes to take place. 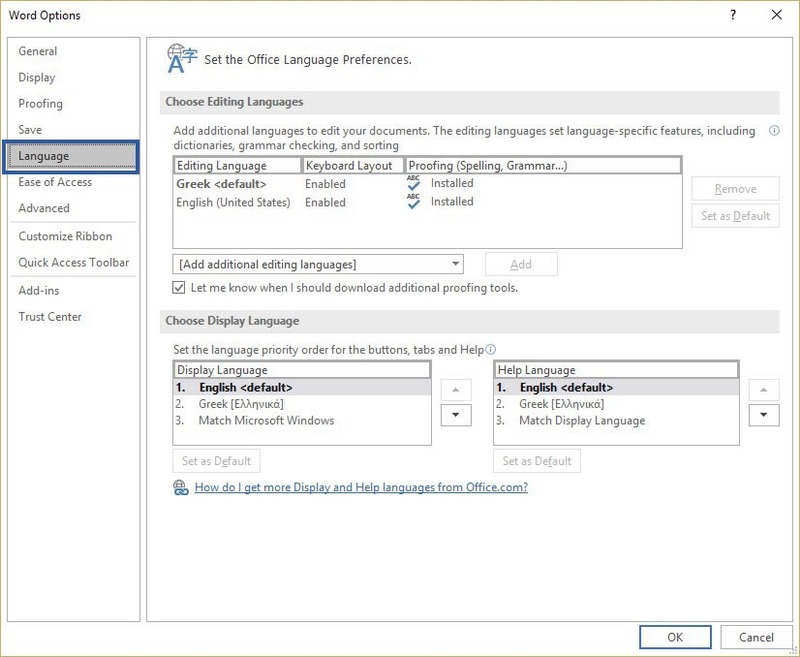 How Do I Get More Display And Help Languages From Office.com? Once the link is selected, we just follow the steps to download a different Language Pack. For this post I have used the Microsoft Word 365 application, but the same procedure stands for Microsoft Excel, Microsoft PowerPoint and Microsoft Outlook. If we change the Display Language for one application, it will take effect to the rest of the applications also. Below you can check out the video describing How To Set the Proofing And Display Language in Microsoft Office 365 applications. Posted on January 8, 2018, in Microsoft Office 365 ProPlus English, Office 365 English and tagged Choose Display Language, Choose Editing Languages, Dictionary, Display, Editing, Grammar, Help, How Do I Get More Display And Help Languages From Office.com, How To Set the Proofing And Display Language in Microsoft Office 365 applications, Language Category, Language Pack, Language Preferences, Microsoft Excel, Microsoft Office, Microsoft Outlook, Microsoft PowerPoint, Microsoft Word, My YouTube Channel, Office Smart, Office System, philippospan, Proofing, Review, ScreenTip, Set Proofing and Display Language, Set Proofing Language, Set The Office Language Preferences, Smart Office, Spelling, UI, User Interface, We Can Add Additional Languages To Edit Your Documents. Bookmark the permalink. Comments Off on Set Proofing and Display Language in Microsoft Office 365 Applications.